About Something Good, LLC, 9780998760100, 32pp. This is the story of the life, love, and adventures of a beloved family dog, and how he delighted and touched his family and everyone he met. Ralphie was born with a heart on his belly. He loves food, his family, his friends, his neighbors. He loves pretty much everything and everyone. And they love him back. And that's how it is all through his life. Read the book and fall in love with him too. Rambunctious and hyperactive, Ralphie had already been returned to the animal shelter three times, but when Andrea and her husband adopted him and gave him a loving home where he was understood, accepted, and taught, he learned fast. As Ralphie's human family grew, so did his capacity for love and the ways he could express it. He remained a loving and beloved family member who touched the hearts of the whole neighborhood until he was ready to say goodbye at the grand-old age of sixteen. Ralphie, Always Loved will remind you of all that is good, and reaffirm your belief in love's power to uplift and transform. ANDREA YERRAMILLI is a former marketing professional who is a mom to kids both with and without fur. She is committed to finding the good in everything, and believes that a sense of belonging to someone's heart is what makes us feel complete; that kindness goes a long way; and that keeping your mind and heart open can help when things happen that you don't understand. Andrea lives in New Jersey with her husband and children. SAMANTHA VAN RIET is an author, illustrator, and graphic designer with more than twenty published books to her credit. She lives in Cape Town, South Africa. —Kim Alfred, The Rescued Dog, San Diego, Calif.
Review: A heartwarming tale of love, patience, wisdom, and the circle of life. It takes patience to love a puppy and wisdom to say goodbye to an old dog with grace. I was honored to know Ralphie and the author and heartened to see another aspect of their lives. 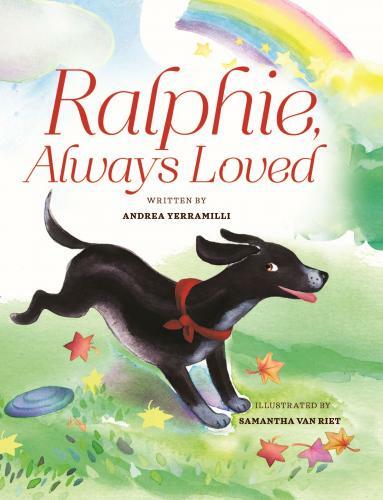 Review: The story of Ralphie Always Loved is a heart melting tale of a shelter dog's journey. Being a dog owner myself, I loved reading this sweet book. It will be meaningful to any family that loves their pet. Review: Four paws up for the story of Ralphie! This tale of everlasting love proves that sometimes the dog we rescue ends up rescuing us. Ralphie’s story will make you smile and cheer and want to hug your own pup a little closer. Review: Andrea writes from her own life experience and enormous heart. Ralphie offers an opportunity for young readers to make multiple connections with themselves and other books they have read. Any child who doesn't have a dog will want one after reading this sweet book!